WASHINGTON — SpaceX launched the all-electric SES-12 telecom satellite June 4 on a Falcon 9 rocket that combined two generations of the rocket. Described by manufacturer Airbus Defence and Space as “the largest and most powerful all-electric satellite ever produced,” SES-12 carries six wide-beam and 72 high-throughput spot-beam transponders for television and connectivity services across the Asia Pacific and the Middle East. The satellite should have enough fuel to last 22 years in orbit — seven longer than the design life of most geostationary spacecraft — thanks to the effectiveness of the Block 5 upper stage, according to SES Chief Technology Officer Martin Halliwell as quoted in Florida Today. The Ku- and Ka-band satellite has a digital processor to flexibly allocate capacity according to customer demand — a feature satellite operators are increasingly demanding to prevent geostationary spacecraft from losing their efficacy as markets change over time. The first-stage booster used today first launched Sept. 7 with the Air Force’s secretive Orbital Test Vehicle 5 spaceplane. 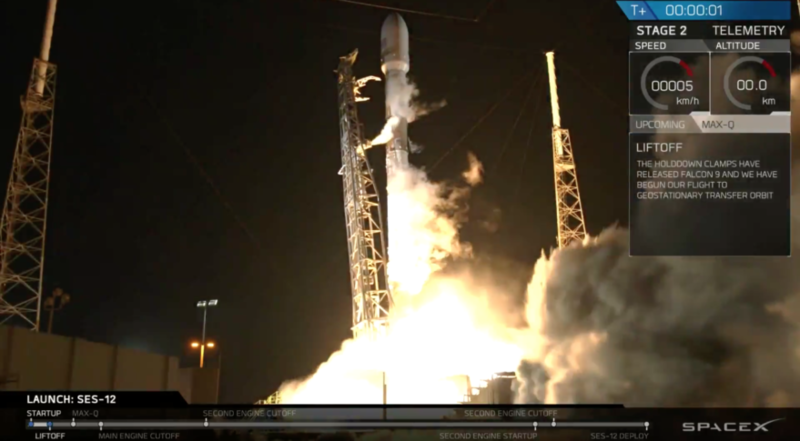 SpaceX did not seek to recover the booster or the payload fairings. SES-12 was originally to launch on an Ariane 5 rocket from European launch provider Arianespace, but SES switched the satellite with one of its SpaceX missions in August. Luxembourg-based SES used that Ariane 5 to instead launch SES-14, a satellite needed on an expedited schedule to replace the malfunctioning NSS-806. An Arianespace Ariane 5 anomaly eliminated the weeks of schedule saving that SES hoped to obtain by switching missions. A trajectory deviation with Ariane 5 sent SES-14 into the wrong orbit, requiring an estimated four weeks of additional maneuvering with onboard propellant to reach its geostationary slot. SpaceX’s SES-12 mission was supposed to occur by the end of March but was delayed until June. SES-12 is a replacement for the 15-and-a-half-year-old NSS-6 satellite. SES plans to co-locate SES-12 with SES-8 at 95 degrees east.